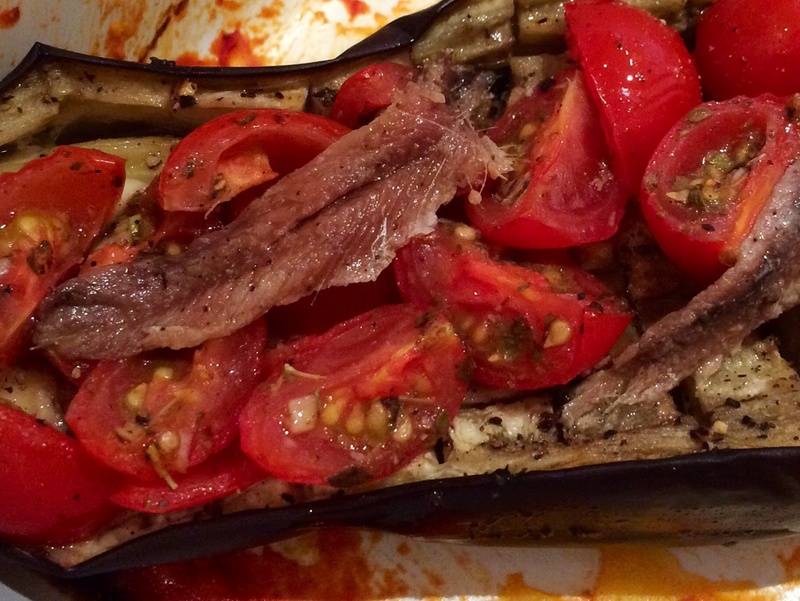 Baked aubergines with tomatoes and anchovies. 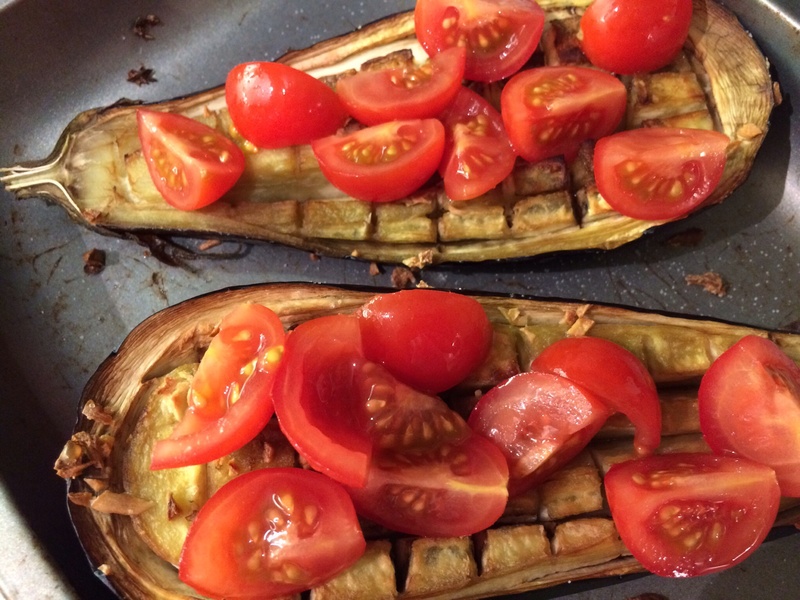 Delicious aubergine bake, with garlic and only a little olive oil. The flavours of the roasted tomatoes and anchovies give lots of delicious flavour. Serves 2. Heat the oven to 180c. Wash the aubergine. Carefully cut in half lengthways. Then run a sharp knife around the inside edge of the aubergine. Use the knife to cut down into the flesh but without cutting all the way through to the skin. Make about 4 cuts lengthways and 6 cuts across (as you would to dice an avocado). Push the chopped garlic into the splits. Brush with olive oil, season with salt and pepper. 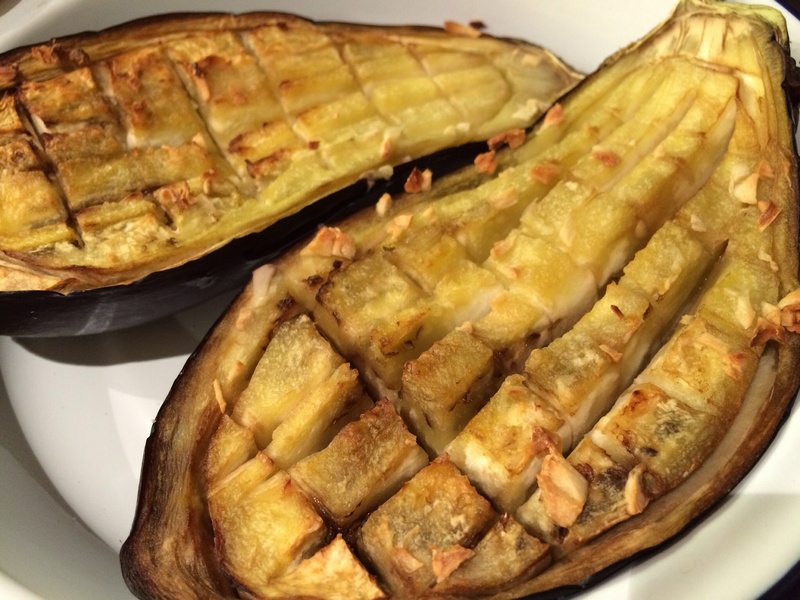 Place the aubergines on a roasting tray and put in the oven for 25 minutes. The flesh should be nice and soft. After 20 minutes remove the tray from the oven. Place the quartered tomatoes on top of the aubergine, lie the anchovies over the tomatoes. Put back into the oven for 10 minutes until the tomatoes are soft. Remove from the oven and add the fresh parsley. Delicious! ← Spicy prawns on a pumpkin and coconut broth.